When I teach you how to use messenger bots instead of email, I’m not trying to teach you to abandon email. On the contrary, I am teaching you how to you how to use messenger bots instead of email for lead generation, conversations, and to complement your email list. Just like any other subscriber opt-in, you will want to create some type of lead magnet to entice your traffic to opt-in. A lead magnet could be as simple as a checklist, pdf or short video and as complicated as an ebook, mini course or done-for-you template system. These valuable info pieces are the typical type of content businesses give away in order to gain personal information such as email or in this case, messenger subscriber. 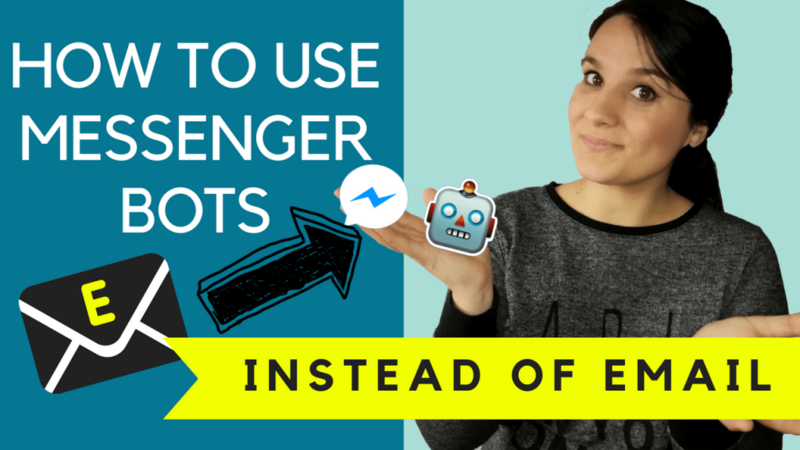 The video above shows you step-by-step how to setup a simple opt-in for your facebook messenger bot. Essentially you create a bot using ManyChat.com, you install the code on your webpage, and you drive traffic to your webpage. Easy! The one downside to Facebook Messenger bots is that they don’t necessarily give you your lead’s email address. So how can you extract your lead’s email address from messenger and import it into your email autoresponder? In the video above, I explain how we connect ManyChat with Google Sheets using Zapier. The idea behind it is that we broadcast a message to our messenger subscribers and entice them to respond back with their email address. Once they’ve responded, Zapier detects it, creates a row in google sheets and places the name and email address i the google sheet. Once that is complete, you can simply import the csv or excel file to your email autoresponder and now you’ve got a back up! This is by far the easiest task of all the three covered in the video above. Just as you would with any other email you send to your list, this one will contain a link to connect to your messenger bot. In ManyChat you would use the Messenger Ref URL growth tool, create some cool response for whomever clicks on the url, and bam! they’re subscribed just like that. Obviously, once your ref URL is set up, you would use that URL in your email sent to your list. There isn’t really much more to be said about that, you’ve just got to try for yourself to see how simple it is.